When it comes to finding the best IWB holster for Glock 26 there are a number of choices. With so many choices how can you be sure you are getting the best one? We have gathered the top three best IWB holsters for your Glock 26. 1 What Is An IWB Holster? What Is An IWB Holster? For those who are not familiar, IWB stands for inside the waistband. These are concealed carry holsters to be used usually for a specific model of handgun. Always remember to check your local laws about concealed carry as they vary greatly. The advantages of an IWB holster are concealed carry and comfort. It may seem counterintuitive that something that goes inside your waistband is supposed to be comfortable, but when you consider the alternative of getting caught up on anything you pass it doesn’t seem so bad. IWB holsters offer a number of advantages over OWB or, Outside the Waistband. Each type has its own advantages and disadvantages and in the end, it is up to you which type you choose. Here are just a few of the advantages of IWB over OWB holster types. First, IWB holsters show less of an outline of your gun. Since they are inside the waistband IWB holsters have an extra layer of clothing between them and your shirt. This on top of the design of IWB holsters allows them to show less when you are practicing concealed carry. Second, IWB holsters are easier to conceal. Think about it this way, if you have an OWB holster and are wearing a t-shirt to cover it and you have to reach above your head then it is likely your handgun will be revealed. With an IWB holster, this is no an issue since the gun will largely be inside of your pants leg rather than beside it. The biggest advantage of IWB over OWB is simply that it is easier to use. Yes, you will have to wear larger clothing to conceal your handgun with an IWB holster, but you do not have to worry about wearing a jacket or anything else you would have to consider with an OWB holster. Just because it is easier to concealed carry with an IWB holster does not mean you should practice concealed carry in locations that do not allow it. Concealed carry is a very volatile topic right now, so always lean towards the safe side and assume you shouldn’t conceal carry if there is any doubt. There are several websites available to check your local concealed carry laws. One of the easiest to use is http://www.handgunlaw.us/ which lets you select your state and learn your state laws. This does not, however, give you any local laws which may be more restrictive than state law. Like everything else, IWB holsters have their own set of disadvantages from OWB holsters. While IWB is the choice of many concealed carry practitioners, so is OWB. This is because there are some things that it simply does better than IWB. First of all, as you may have guessed, since IWB goes inside of your pants it requires oversize clothes. They do not have to be huge, one size up on pants and shirt should be sufficient for most handguns. If you are already towards the top of a size then going up two sizes may be needed. In the unfortunate situation where you need to be able to access your handgun, OWB holsters do offer quicker access. This is simply because they are easier to get to. They also are easier to holster once you are done or when you are gearing up. The Concealment Express holster is the first on this list. It will fit a Glock 26, 27, or 33 making it a great holster for anyone with more than one model Glock. Since it will hold multiple models you can save on additional holsters since you can just use the same one for each. 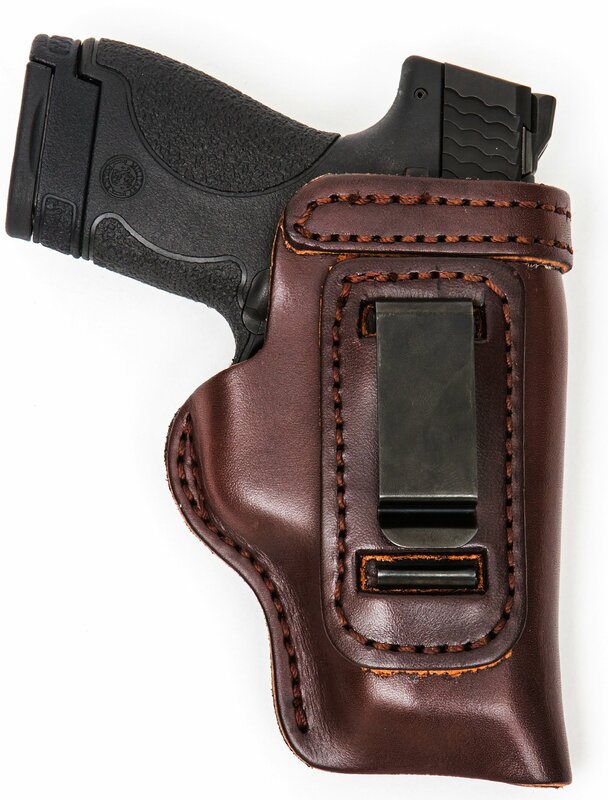 This holster is also very easy to conceal since the only visible part of the holster will be the retaining clip. You will still have to worry about the grip of you gun showing, but this is true of any holster. Another area where this holster shines is in its moister protection. Because of the construction of the holster, it prevents moisture from getting to your Glock and damaging it. This is thanks to the Kydex material it is constructed of. The downside to this is it will stick to your skin of you sweat too much and will be uncomfortable. Kydex is a hard plastic that is often used in aircraft as well as knives, guns, and other weapons. It is a very durable and strong material that should offer you years of life. Because of the properties of Kydex, it will not stretch or get distorted with use over time. Can stick to your skin if it is hot and sweaty. Like the Concealment holster, the Galco supports a number of Glock models, but it actually supports much more than the Concealment. This Galco holster can carry Glock models 17,19,22,23,26,27,31,32,and 33, so it will support a wide range of models. The construction of the Galco is better than similar holsters. The soft parts are made with 100% leather while the hard parts are made of sturdy hard plastic, Kydex, and steel rivets. This should give it a long service life, but it is not going to protect your Glock as well as a better-covered holster would. Thanks to the design of the clip the Galco allows for a range of custom fits. Thanks to the way it locks onto your belt you can move the holster up and down on your belt for different heights as well as adjust the angle. This allows you to adjust your draw angle for the best comfort and speed. Can support belts up to 1 ¾ Inches. Not much protection from holster wear. Can make it difficult to tuck in your shirt. 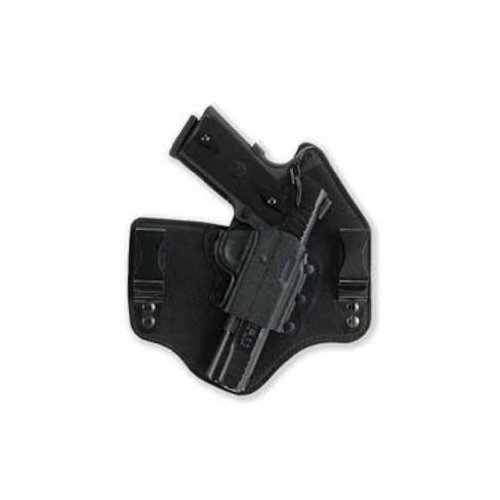 This is another holster that supports a wide range of Glock models. In this case it will hold Glock models 17, 19, 20, 21, 22, 23, 26, 27, 29, 30,, 31, and 32. This is because of the construction of the holster. It is molded leather construction, so it is going to provide a good fit while remaining flexible. The Pro Carry HD comes in both brown and black leather. The leather should not bleed out into your clothes when you sweat like some cheaper leather can, but you should still avoid getting it too wet unless you decide to treat it with a waterproofing spray. This can help protect your Glock as well by keeping out water. Tight fit for some models. Thick due to leather construction. The best IWB holster on this list is the Galco KingTuk thanks to its highly adjustable clip, the wide range of models supported, and support for larger belts. When choosing an IWB holster there are several options out there, but if you choose one that is adjustable, comfortable, and does not leave a noticeable impression in your shirt then you should end up with a good holster that will serve you for a long time. 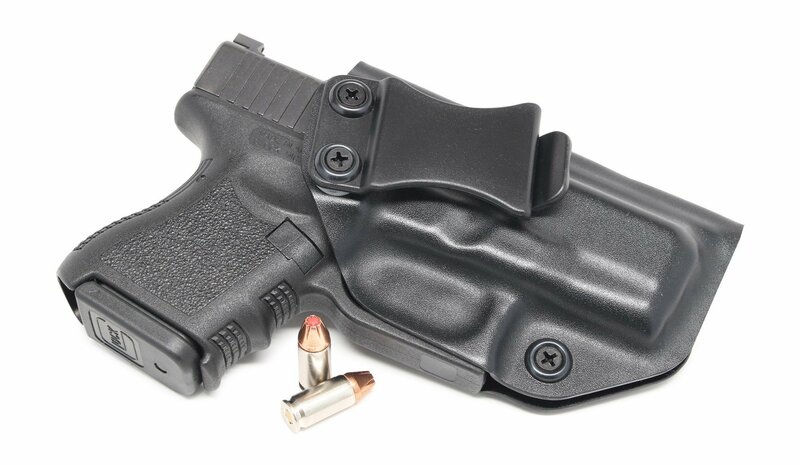 So, do you agree with this list of the best IWB holster for Glock 26?